survivors of a train wreck in 1856. Ambler, Pa. is named for her. 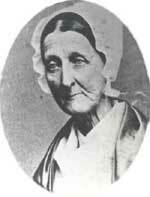 Mary Johnson was born in 1805. She was raised as a Quaker. Mary Johnson met Andrew Ambler. He was a fuller. His job was to process woolen cloth. He did this in a fulling mill. Mary and Andrew were married. They moved to live near Andrew’s fulling mill. Mary was a small woman. She never weighed over 100 pounds. Even though she was small, she was very active. Mary and Andrew had eight children. Seven of them were boys, and one was a girl. Mary was a devout Quaker. She started a Sunday school for children in the area. She was always ready to help her neighbors. The Amblers had the only well in the area. When her neighbors needed water, Mary always let them draw water from her well. Andrew Ambler died in 1850. After that, Mary and her sons managed the fulling mill. On July 17, 1856 a train left Philadelphia, carrying about 1000 people. More than 600 of them were members of St. Michael's Roman Catholic Church. Many of them were children. They were going to a picnic in the area of Fort Washington. It was about 6 o'clock in the morning. As the train traveled along the North Penn Railroad line, a terrible thing happened. A train came from the other direction on the same line. Neither train could stop. The two trains collided. 59 people were killed right away. Many people were injured. Mary Ambler heard about the accident. Immediately, she gathered medical supplies and started walking to where the wreck had happened. She had to walk several miles. When Mary arrived at the accident scene, she found that no doctors had arrived yet. People had come to help, but they were not organized. Mary took charge. She asked people to carry those who were hurt to her house. Volunteers tore the shutters off of nearby buildings. They used the shutters as stretchers. They carried many people to Mary’s house. After things returned to normal, Mary continued her life as before. She worked with her sons to manage the fulling mill. She was active in her faith. She helped people in her community. During the Civil War there was a need for good woolen cloth. The Ambler fulling mill made woolen cloth and blankets and sold them to the Union Army. Mary Ambler died in 1868. Later that same year the town officials decided to change the name of their train station. In 1869 they named the station Ambler in honor of Mary. The surrounding area was still called Camp Hill. In 1888, the borough was also given the name of Ambler. Ambler, Pennsylvania takes its name from Mary Johnson Ambler. Reading Level 4.9. Portrait of Mary Ambler courtesy of Ambler Then and Now.